Join us for our Salon Series, where Letterform Archive staff invites you to experience materials related to a specific topic of interest to the collection. This month, Barcelona-based calligrapher Oriol Miró will curate and discuss a selection from the Archive’s collection of work by Rudolf Koch. Koch was proud to be called Der Schreiber, signifying his devotion to the craft of the pen. In addition to his calligraphy, Koch was a type designer, woodblock printer, and an influential educator. Well-known students of Koch include Berthold Wolpe, Fritz Kredel, and Warren Chappell. 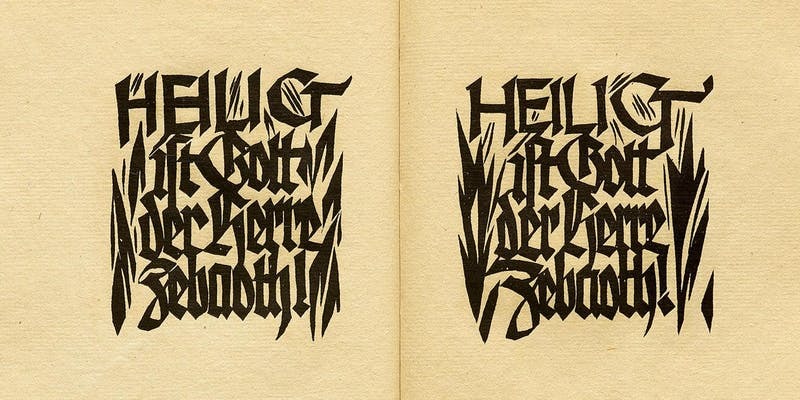 Koch designed over a dozen typefaces, including Kabel, Neuland, and Koch Antiqua. Barcelona-based Oriol Miró has worked as a freelance calligrapher since 1994. He has taught calligraphy at Elisava (Barcelona) since 1994, typography at IDEP (Barcelona) since 2006, and calligraphy and lettering in the Master of Advanced Typography at Eina (Barcelona) since 2008. He has served as head coordinator and instructor in the Escola Visions (Barcelona) since 2015.